This story first appeared in CityLab. Find the original version here. “It’s the narrative of Manhattan being the center of the highest of high-style architecture and where wealth was based, where influence was based,” architectural historian Frampton Tolbert recently told CityLab. Tolbert’s project, Queens Modern, surveys, documents, researches, and promotes Midcentury Modern architecture in Queens, New York. Featuring a database of Modernist buildings in the borough, Queens Modern draws from the Queens Chamber of Commerce Building Awards program, first organized in 1926 to honor excellence in design and construction. 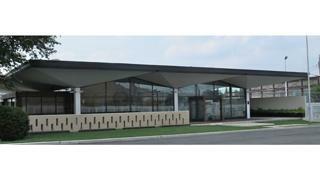 After all, the Modernist movement in architecture didn’t take shape and flourish until the early and mid-20th century. By then, Manhattan had already undergone much development; Queens, on the other hand, was really just getting started. The Long Island Railroad, Queensboro Bridge, and the New York City Subway system all connected Queens to Manhattan in the first two decades of the 20th century. According to a 1940s Queens Chamber of Commerce pamphlet, 61 percent of all buildings constructed in New York City from 1930 to 1943 were in Queens. The population of Queens also rose an average of 20 percent each decade from 1940 to 1970, while Manhattan, the Bronx, and Brooklyn’s populations declined or remained steady. Barkin, Levin & Co., an industrial building in Long Island City, was designed by Ulrich Franzen. In many cases, award-winning buildings from those years had been largely ignored since. “I realized there were a lot of these buildings in Queens and I wondered, why are these buildings here? No one’s talking about them. There’s no documentation on them,” Tolbert said. One of Tolbert’s favorites is an industrial building in Long Island City, designed by Ulrich Franzen and built in 1958. Industrial buildings, particularly common in the Queens neighborhood of Long Island City, and religious buildings are among the types of Modernist structures that are particularly vulnerable. For example, one Long Island City industrial building in the Queens Modern database was demolished to be replaced by a large hotel. “Closed in early 2014, the Pan American Motor Inn’s future is unclear, but the building remains,” the Queens Modern website states. 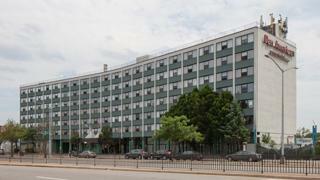 The Modernist hotel was designed by Brodsky, Hopf, and Adler and built in the Queens neighborhood Elmhurst during 1963. 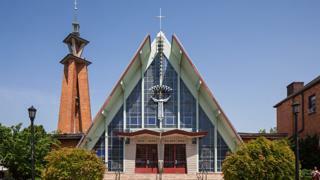 Architect Jonas Mulokas specialized in Lithuanian Catholic churches and designed this one in Maspeth, Queens. On the Queens Modern website, Tolbert also describes the Church of the Transfiguration as “one of the most unique and striking structures honored by the Chamber of Commerce during this era.” The church was built in 1962. “Nestled within a compact residential part of Maspeth, the A-frame church incorporates traditional Lithuanian symbols into a definitively modern structure,” Tolbert writes. 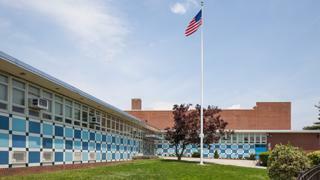 Besides architects and general fans of Modernism, Tolbert has received positive feedback from Queens residents eager to learn about the history of buildings in their neighborhoods. Over the past two years, he's led tours of modern architecture in Forest Hills and Rego Park. People who live in these neighborhoods showed up and said they wanted to know more about the buildings on their home turfs.